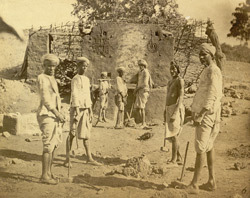 Photograph of copper and iron mining scenes at Alwar in Rajasthan, taken by Thomas Cadell in c. 1873, from the Archaeological Survey of India Collections. This image, possibly of the entrance to the Dareeba copper mine, is one of a series of photographs shown at the Vienna Exhibition of the same year and mentioned in the exhibition catalogue by John Forbes Watson. After photography was introduced into India in the 1840s it rapidly grew in popularity, particularly as a means to record the vast diversity of people and their dress, manners, trades, customs and religions. The first official attempt to create a comprehensive record of Indian types was the 'The People of India'; an ethnographical survey edited by J.F.Watson and John William Kaye, and published in eight volumes from 1868 to1875.